By integrating the Paygol Platform in your shop, you will be able to receive payments from customers all over the world. Whether you are an established business looking to explore the emerging markets of Latin America, or you have just opened your first web-shop and would like to focus on more developed markets, Paygol has the right solution for you. Keep track of your transactions in the Paygol Reports section. Search for transactions based on the country of the consumer, the payment method used, or the unique Paygol Transaction ID that is generated for each payment. Maintain a clear view of how your business is trending by tracking your sales day-to-day or month-to-month. Recognize sales trends early in order to maximize opportunity and minimize costly mistakes. Gain customer insight with the tools provided in the Paygol Statistics section. Use our interactive map to quickly identify sales trends by region and make sure that you are providing the appropriate payment methods to your customers. Geo optimization in the Paygol payment page automatically shows your customers all of the payment options that are available in their country or region. Upon choosing their preferred payment method, they will be redirected to a familiar payment page where they can feel comfortable completing their transaction in a secure environment. Please check out our website www.paygol.com and fill out our Merchant Contact Form (https://www.paygol.com/en/get-started) in order to allow us to better understand your business. A dedicated account manager will review your form and contact you to discuss a solution that fits your needs. Thanks to the official partnership between Paygol and PrestaShop, integration is easier than ever. Log into your PrestaShop admin dashboard. Activate the module (Go to “Modules and Services” → Select "Payments and Gateways" → Look for "Paygol" → Click on "Install" → Click on "Configure"). Log into your Paygol Dashboard and go to the "Notifications" section. Copy the Service ID and Secret Key and paste them into the corresponding fields at the module's setup page, at your PrestaShop admin dashboard. Save the changes. 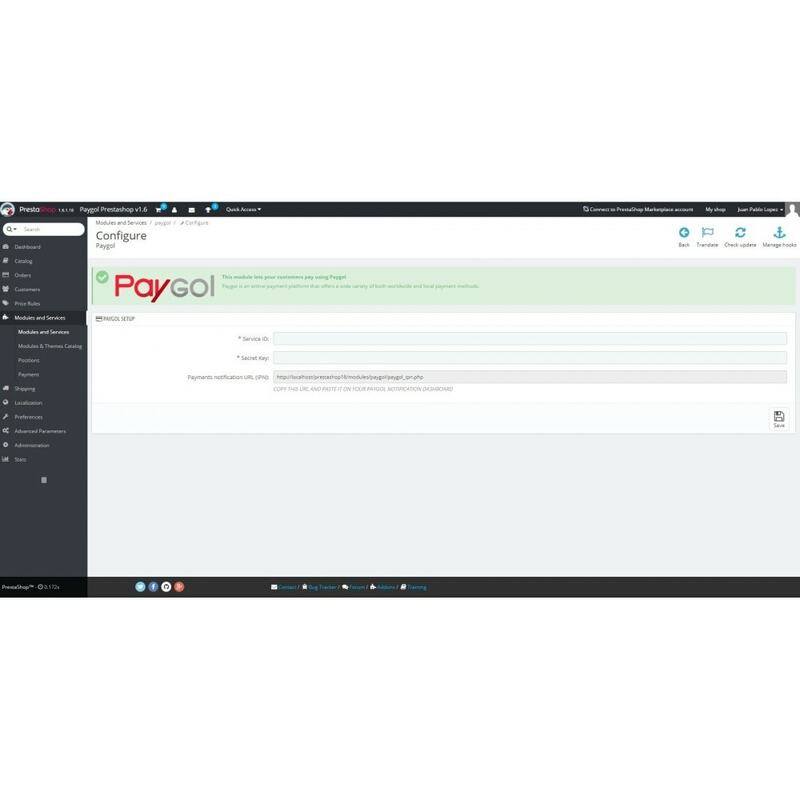 Copy the "Payments notification URL (IPN)" from your Paygol's module setup and paste it into the "IPN URL" field at the "Notifications" section of your Paygol dashboard. Save the changes.